The Long Bay Golf Club in Longs, South Carolina is located just north of Myrtle Beach. Large waste areas, pot bunkers, and mounded fairways make this course not a typical Jack Nicklaus Signature Golf Course. Locals and tourists agree that Long Bay has a distinct character and is one of the most challenging golf courses in Myrtle Beach. 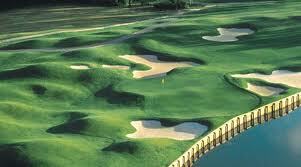 The course features two unforgettable challenging holes, the 10th and 18th. The 10th-hole is a par 4 with deep waste bunkers boardering the fairway. At the 18th-hole, golfers come toe-to-toe with a dogleg right that plays around a huge lake. Golfers brave enough to play from the championship tees will encounter a slope of 137 (127 from the ladies), misleading par 3 holes, and deep pot bunkers. Long Bay offers all the ingredients for a perfect game of golf: a 4.5 Star rating by Golf Digest, manicured greens and fairways, a fully stocked pro shop, a stunning clubhouse, and a grill that serves American cuisine. Remember…Golf in Myrtle Beach and book your tee time now at the Long Bay Club. Golf packages are also available. The Long Bay Golf Club in Longs, South Carolina is located just north of Myrtle Beach.